Use a DFRobot MiniQ chassis to create a robot that streams video over WiFi. It can be used to move around your house and spy on anything. This project allows you to drive a robot via a webpage and view a live stream. It can be used to spy on pets, make sure nothing is burning in your oven, and even bird watching! I began by assembling the 2WD MiniQ chassis kit from DFRobot. I slid the wheels onto the motor shafts, then inserted them into brackets and attached them to the chassis. Finally, I added the metal supports. Now it was time to build the main board. The L293d motor driver got soldered in place, along with wires running to the Raspberry Pi's GPIO pins. Next, I soldered a connector for the battery, as that will provide the main power. After the power source was added, I installed a 5V regulator. Then I saved and ejected the card and put it back into the Raspberry Pi 3. This should now allow for the usage of SSH and connecting to WiFi. to bring up the menu. Go to "interfacing options" and then enable the camera. Now just select "Finish" and insert the ribbon cable of the camera module into the correct area of the Pi. Then came the part of how to control a Raspberry Pi over WiFi, because Bluetooth has too little range. I decided on using a Flask server running on the Raspberry PI and an ESP8266 ESP12E module to send data to it. The ESP8266 only has one analog input, which means I couldn't use the joystick directly, as it takes two analog inputs. The best option was the ADS1115, which is an I2C device that reads analog signals at 16 bits of resolution. I simply connected SDA to 4 and SCL to 5, along with VCC and GND. The joystick X axis connects to A0 on the ADS1115, and the Y axis connects to A1. BUT, I accidentally burned out the ADS1115, so I had to resort to the next-best thing: buttons! So now my setup is an ESP8266 Sparkfun Thing Dev Board with 3 buttons- forward, right, and left. Now whenever one is pressed, it sends data to turn the wheels in that direction. I made a previous project that utilized the Pi's GPIO PWM library to control motors via JSON, so I just re-purposed the code to accept data via a Flask app instead. Flask is a Python library that essentially turn your Pi into a webserver capable of sending and receiving data. By using PWM, the motors can be controlled with greater precision compared to tank drive. This also means the robot can go at variable speeds rather than a fixed one. My flask app is configured to change the PWM of the motors once it receives data from a GET request via http from the ESP12e. It also uses the subprocess.Popen library to run the webstreaming script in the background. I have attached code to the project page, so all that is necessary is a download. The code was pretty simple, just take readings from the 3 pins, run them through some if statements to determine wheel direction, and finally send those values to the Raspberry Pi. The ESP8266 board addition for the Arduino IDE comes with the HTTPClient library, which handles headers and sending data. 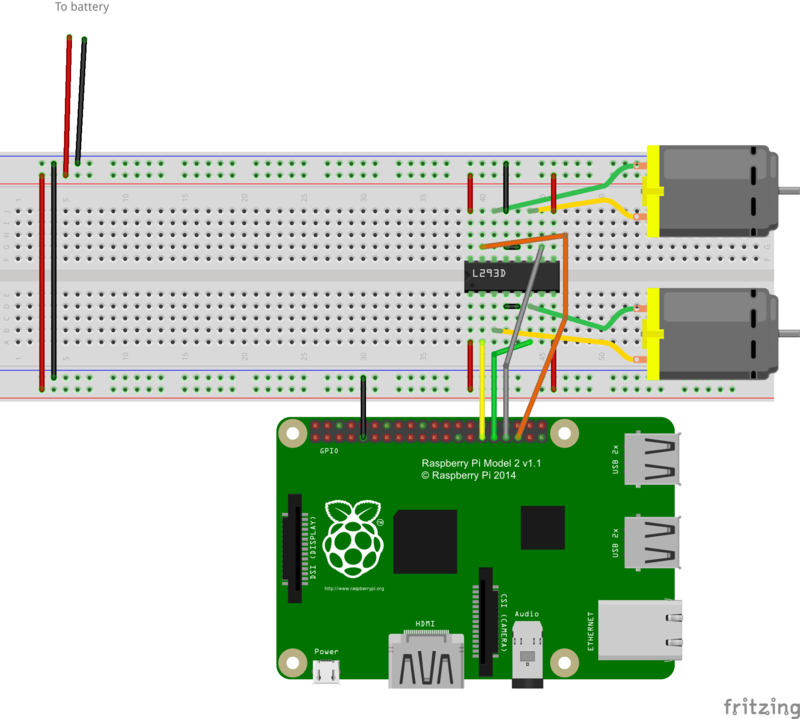 The Flask server needs to receive data via a POST call, so the code starts a connection with the Raspberry Pi webserver, then adds a header to the data denoting that it's JSON encoded, and finally it sends the data in the form of a JSON object. I added a 40 ms delay to prevent the Raspberry Pi from becoming overloaded with data. You should see the camera light up, and by going to the web address of the pi with the port 8080 the stream should be visible. Now you can use the controller anywhere in the house and have a live feed as well.